My brother threw an iftar (Ramadan fast-breaking dinner) for his friends (and some of their wives) and I was given the task (or permission) to make dessert. I wanted to make vegan desserts, but he was totally against it. So, I made a deal: Two Vegan desserts and one non-vegan dessert (I’ll explain in another post why I prefer baking vegan). As you can see, the coconut oil cookies came out flat. They tasted fine, but were not as pretty as the butter cookies. While talking to a friend about them, I remembered the other time I tried coconut oil in a cookie recipe that called for vegan margarine (which I do not use) and having the same results. The next time I made those cookies, I used less oil and they did NOT come out flat! I guess it has something to do with coconut oil being an OIL, despite it being a solid fat (at room temperature). I also made chocolate pumpkin pie brownies, which I made as mini cupcakes because of the amount of batter and people. The recipe says to bake at 330 (why the odd baking temp I don’t know) for 23 minutes, but as a cake. Mini cupcakes take less time to cook and I left them in for about 20 minutes. It was hard to tell when they were done using the toothpick test because of the chocolate chips melting and making the toothpick “dirty”. So, I think I over-baked them. They were hard on the outside and kind of dry. I had some leftover batter and made a mini-loaf, which I baked separately and which was a lot moister. 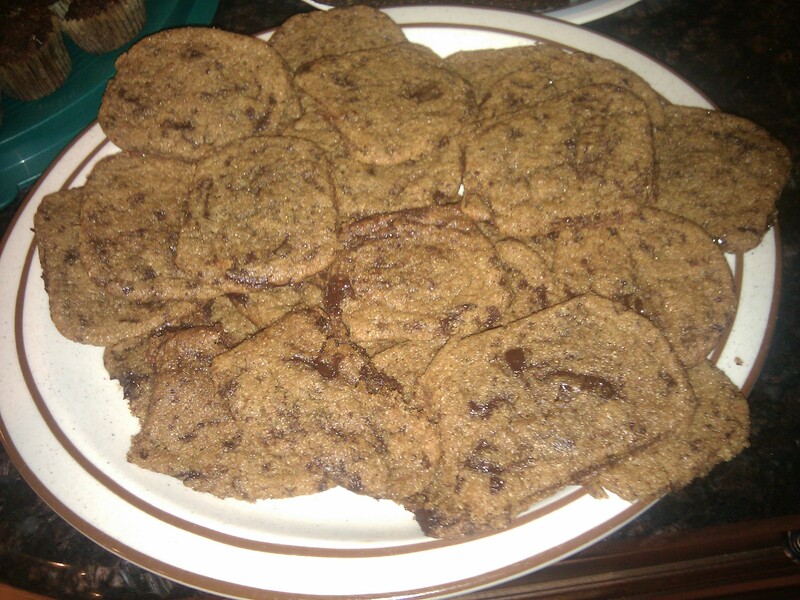 These were vegan and I used a mix of whole wheat pastry and spelt flour. I also doubled the recipe and used pumpkin puree that I made myself from pumpkins I got from a farm. The oil I used was coconut and chips were made using Trader Joe’s Pound plus 72% chocolate. People actually thought THESE were brownies (the squareness threw them off). I was going to make them into cupcakes, but I needed to get done since my brother needed the oven (he was supposed to be done sooner than he was). I was told they had a weird texture, even though I used the same flour mixture for these as for the brownies. I wonder what it was. Anyway, I have plenty of vegan frosting to ice them…or to make into cake balls. Actually, no! The cake was supposed to be a cake, but I’m not sure what size (she never states in the recipe). The brownie cupcakes WERE supposed to be a cake, but nothing was mentioned about texture weirdness, lol. I thought all cakes could be made into cupcakes…didn’t know there was a baking soda/powder difference. I love anything chocolate and realize the delight of home baked meals and desserts more and more alhamdulilah! Really liked both cookies, the coconut oil left a coconut taste that I enjoyed. Need to chew more slowly so I can give you better feedback on the rest of the items 😉 Everything had chocolate in it so I was happy. I love you Umm Ihsan…you always make me laugh lol..(chew more slowly). Amani, I’m sure it was great if Umm loved it 🙂 but what kind of pan size did u use? Because that can be a cause to it as well. If the recipe calls for a big size pan and you use a small one you’d find the texture a lot more denser and depending on the leavening (baking powder and soda) it was either too chewy or too airy. I don’t know that’s my two cents that is prob not needed. Its just that I had a lot of trial and errors in the past but you only learn from them. Everything was delicious! I especially liked the Coconutty choc chip cookies 🙂 . They might have been flatter, but I liked them even better than the regular, traditional ones. The taste was something I wasn\’t expecting. Almost reminded me of a GS Samoa or a German Chocolate Cookie. Yum 🙂 Thanks for the treats, Amani!